collected coral's died so joe blow and his idiot kid's can buy a coral skeleton so they killed live one's to make this nighmare. I was once in a arts and crafts shop here in SC and saw sun dried seahorses I walked right out the door of the shop and never went back. They went out of business last year I don't understand how people could be so cruel. If they harvested them specifically for this purpose, I agree 100%. If the corals died and they looked to sell them, not so bad. I would rather they were used then tossed in the trash, or they can send them to me for my calcium reactor, so I can put them back to life. Midnight Angel wrote: I was once in a arts and crafts shop here in SC and saw sun dried seahorses I walked right out the door of the shop and never went back. They went out of business last year I don't understand how people could be so cruel. the same store had a bin I mean of at least a few thousand baby seahorse's and above it was fish, they also had shells, starfish, puffers, everything that would tie your stomach in a knot. Some things hurt us more because we can see them.The dried seahorse trade for curios and the live ones sold for aquaria is nothing compaired to the TONS used by chinese traditional medicine. And houses,foundations of roads and of the airport strip in Maldives are made of live coral! Makes me sick....all of it ! very true I just don't understand some of the things people do for souvenirs whatever happened to getting a snow-globe of the area you stayed at and the name on the base? that's all I need from my vacation and the pictures, and videos and memories not some of the area's livestock. 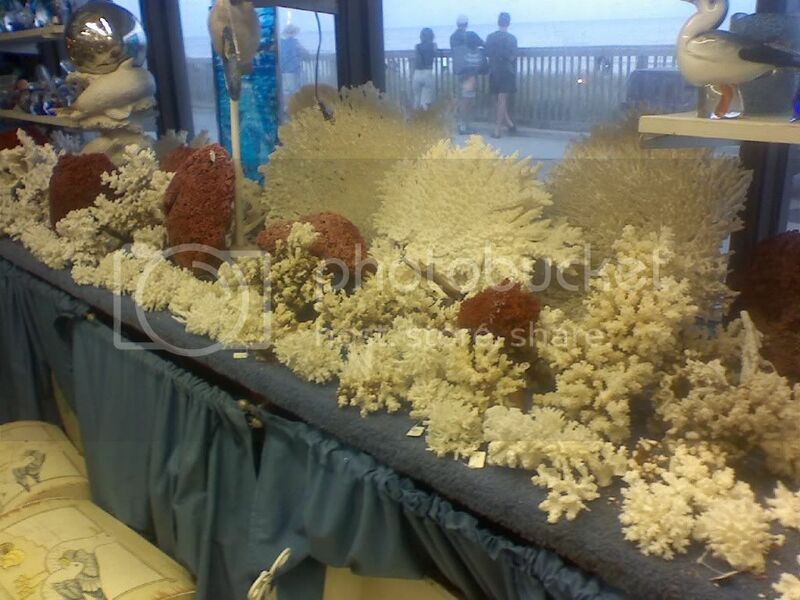 How do you guys feel about coral collected for the aquarium trade? First of all Richard Ross I admire your work And I just had to let you know. Personally I don't mind coral collection (live corals that is) for the aquarium trade. I feel the same way about it as I do about the fish. If people can't see what is in the ocean than it is harder for them to care about it. It's sort of like the saying if you can't see it it isn't there. And god knows most of the reefers I know are very concerned about the state of our oceans. And some corals can get wiped out in their native waters. Their only hope has been with dedicated reefers reintroducing them . But this lesson was learned years ago with freshwater fish like white cloud mountain fish. And again beautiful reef tanks teach us all about our oceans. So I think coral collection for the aquarium trade should continue. corals for the aquarium trade are like this they collect some species of coral's that are doomed to start with however on the good side most coral's survive shipment and get to responsible aquarist who can keep them propagate them or even breed them and sell cutting back just a little bit at a time on the wild collected species to hopefully a point where they don't need to be harvested from the wild but from a coral farm. I have avoided this debate as Im not sure it is good but why not!! Anyway i think you need to be very careful about where you draw a line on issues such as this. Personally i know people who collect curio trade corals, it is the same as any fishery, it needs to be made sustainable just like everything else. The licenses in Australia that govern coral collection are both for live and dead corals, and the rules are basically the same, it is of restricted quota and weather it is taken out of the ocean for use as live or dead matters little to the reef it was remove from, it still has to be sustainably harvested. The issue of this stuff is one of one's own personal moral stand point, i would be suprised if many aquarium lovers saw this trade as good, having said that when i starte din marine tanks 25 years ago all you could get was this stuff, so the hobby changed, is this good or bad? As for seahorses, if one removes any over fishing issues then ultimately seahorses for the curio trade are no different to much of the wild harvest for live trade, most seahorses die at the hands of aquarists, very few get into peoples hands who can keep them alive, dont forget most people on MOFIB are not general fish keepers and probably have a higher skill set (aside from myself) at keeping seahorses. Having said that much of the seahorse trade appears to be unsustainable in many asian countries, but this is very little to do with curio trade i suspect. Lastly, Lance i hate to say this but i think you will find 99.99% of corals collected die at some point in their aquarium life, again i dont think MOFIB members represent much of a model for general aquarium hobbiests much less general marine tank keepers. Coral Farms sure are great things but this is only a minor part of the trade. especially in this country, obviously MOFIB seeks to help relieve this wild collection but we can only go so far. Personally i think this is an issue based on ones own moral stand point, im not going to say any of you are wrong for seeing it as bad, but just be mindfull of a greater picture. I personally try to be as open minded about these issues as i can, but i try to be realistic about the pros and cons to any debate. We humans use the resources of the earth to further our own good, real or imagined. It's what we do. To a certain extent, we do it to survive and make sure that our species survives. Only the forward thinkers will extend that to making sure the planet survives minus what we take from it. Sustainablility is key here to what we take, but there is also an element of change that will happen no matter what humans do. There seems to be a real, and I think good, trend to think that the global and inevitable changes should not occur because of human activity. I agree that sustainability is key to all of this, but we also need to take all the different cultures in the world into account. I spent a year in South Korea, and accidentally ate a peice of dog meat once at a restaurant. For them, eating dog meat is a way of life. That is part of their culture. I also spent a year in Iraq, where is saw many things that no person should ever see. But the Iraqi people, because of Saddam, are not effected by violence like we are. Violence is very much a part of their culture. So we could argue this any way we want, but it comes down to this. There is very little that we can do to change our own culture, so why would we think that we can change another one? If our planet is going to go through a big environmental change, then it is going to happen. There is no way that we can change every culture in the world so that what scares or bothers us doesn't happen, because other cultures have different prioritys. The only way to save our oceans, and reefs, and anything else on a global scale can only happen if the whole world agrees, and as long as we have things like genocide, war, or hunger, its not going to happen. Broodstock: Flame Hawks, Engineer Gobies, Ocellaris Clowns, Bangaii Cardinals, FireFish Magnifica, Azure Damsels, more to come with time! You have some good points ! My family is Native American and some members still kill and eat turtles and wear their shells. I HATE THIS. But I love my family. And most people (myself included) really respect Native American culture. But most people would hate some of the old practices. I rescue turtles. So I see it all as balance. But you are right that all people and all cultures have to be on board to make real change. And it is hard to get people to care about the ocean when they can't even feed their family. I grew up poor and know what it's like to be hungry. But I'll still never eat a turtle Cultures are still made up of individuals so there is always hope ! I believe cultures, and the culture of people, can change. We've seen this in the past several decades concerning "global warming". When Al Gore was pitching it in the late 1970's, nobody was on board with his ideas and most people thought he was a lunatic. The culture concerning global warming has changed dramatically in the past 30 years.